Style Type: Baseball Cap. Style Baseball Cap. Color: Red. 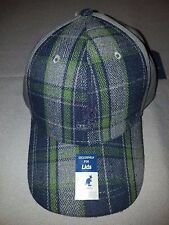 COLOR: NAVY GREY GREEN PLAID. The Kangol Ambition Links Adjustable Cap is a bold new cap with a lot of attitude. A simple classic baseball style crown & fashionable flat peak give this cap a versatile style, with a 3D embroidered ROI logo on the front & AMBITION embroidered in 3D on the underbrim. Authentic Kangol Apparel. Size: One size fits Most Snapback. HAT TRICK FAN GEAR. Content: 50 % Cotton 50% Polyester. We appreciate your cooperation. 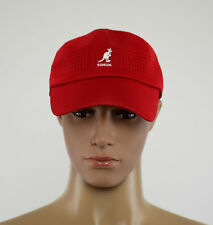 Show your high end Sensibility and Style with a Kangol Stretch Fit Baseball Cap. Embroidered Kangol Logo. Authentic Kangol Apparel. Color: Dark Navy Blue Distressed Blue. Flip Color Bill (Red Underside). The Trucker 5 Panel Cap is made from laser cut faux leather which has a lightweight jersey knit backing making the fabric breathable. KANGOL AUTHENTIC RETRO HAT BASEBALL CAP SIZE S/M FITS ALL Red. Shipped with USPS First Class Package. The Sport Racer is a 5 panel hat made using Taslon fabric, that has water resistant & wicking properties. It is strong, durable & lightweight, with an adjustable strap at the back. The underbrim, internal taped seams & eyelets are a fun color pop.